Forbidden Fruit is the debut scent from the television series Desperate Housewives, now in its third season on ABC. Created under arrangements with Coty, the Forbidden Fruit fragrance is a fruity floriental with notes of Rome apples, orange blossom, peach, wisteria (a nod to the show's fictional Wisteria Lane), jasmine, ylang-ylang, passion lily, cedarwood, sandalwood, vanilla and tonka bean. Despite the name and the advertising, Forbidden Fruit is not quite as fruity as I expected. It starts with tart apple with a touch of citrus, then settles quickly into a woody-musky floral with only subtle hints of peach. It is nowhere near as va-va-voom as the ladies arranged over the apples might suggest, but the dry down does have a nice warmth, and it is not at all overly sweet — in fact, it smells like they might actually be targeting women over the age of 20. Forbidden Fruit isn't a bad fragrance. It just doesn't have anything particulary distinctive or unusual about it, and given the current sea of fruity florals out there, it is hard to see how it is going to make a huge mark. On the other hand, Desperate Housewives apparently has over 20 million viewers: not a bad captive audience for a fragrance launch. Maybe it'll make a mint. My vote for the next TV-inspired fragrance: something fronted by Hugh Laurie of House. Make it nice and dark. Oudh wood with a nice medicinal haze floating over it, maybe some incense? Oops, I guess that's 10 Corso Como. 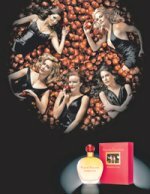 Desperate Housewives Forbidden Fruit is available in 100 ml Eau de Parfum, and is exclusive to macys. Great paragraph on House, there! I think the Laurie fragrance should also have something chilly and unexpected, sort of a Tuberose Criminelle opening. Yes, that sounds good too. Actually, they could bottle just about anything & have Hugh Laurie front it, and I'll buy it. Just saying. Hee! You and me both, R.
Robin, true Oud *oil*, not wood, has an incredible medicinal scent to it, like ether wafting down the halls of a hospital. Additionally, the true Oud will make you pass out. It is incredibly potent. The Buddhist monks smoulder the wood for the same effect, except then know the limit, and use it to reach theta stage for meditation. I'm lucky enough to have a true master who has gifted me with small amounts of true Oud over the years. I need to be near a bed when I dab less than one drop on my wrist. Um, unlike you, my mother and others here who swoon over that actor's character, I'd grab his cane and beat him over the head with it if he spoke to me like he does the passives on that show. Oh, I just remembered, some have whacked him, and I think somebody shot him. Smell of gunpowder in his perfume? LOL. And thanks for the oudh lesson! It should also have a smoky element to it. He loves jazz and plays the piano, so it seems to me that maybe tabacco, and bit of smoke and oakmoss perhaps (his apartment is dark and dingy), could work to pull together a jazzy, dark and sultry fragrance. Well, I'm sure there are other things that can be thrown into the mix, but we'd have to keep it dark and brooding. House scent I'd buy in an instant. This one, no! I'm waiting for Eau de Lost. Coconut mixed with desperation and a whiff of imaginary peanut butter. Brought to you by the House of Hanso. “My vote for the next TV-inspired fragrance: something fronted by Hugh Laurie of House. Make it nice and dark.” Oh lordy, wouldn't that be something! Perhaps a nice civet note to connote the smell of an a**h***, too What an awesome idea, hee hee, I love it! I adore Hugh Laurie – he's one of the best actors to ever grace the television screen. DHFF might be another we agree on, M! I might be the only person in the US who has never seen Lost so your associations went right over my head, but I'm guessing it would sell better than House. Sure, throw in some civet, why not, LOL? And completely agree on HL. We should do a set and include a fragrance for Bertie Wooster — something Eau Sauvage-ish. Good, glad someone else is as out of it as I am! Forget the Housewives….I'd like to see a fragrance designed for Emily Deschanel's character on Bones. Something dark and dank and slightly secret, redolent of mysteries unsolved with a 'was that or wasn't that' whiff of decay. Mix all that up with something cerebral to distinguish it from Morticia Addams' fragrance and I'd definitely give it a whirl! I haven't heard of Bones, but from the scent you've developed, sounds like it might be something I should watch! Desperate Housewive's Forbidden Fruit has only just been released in Australia, but the general public is still getting over the release of Kylie's Darling. I find it fresh, and yes, yet another fruity floral suitable for day wear. How is Kylie's Darling, anyway? I don't think we get it in the US until next year. Kylie's darling is nothing special in my opinion, its floral and quite fruity when you first spray it (it has star fruit in it), but it settles to yet another soft floral. It is appealing to a wide portion of the population – I work for a perfumery company and we have sold ot completely over christmas both old ladies and teenagers like it but the women who LOVE it are all in their early 30's. Thanks for commenting — I can't remember when it is coming to the US, but it isn't here yet. Sounds very much like your typical celebrity scent.